"Here's my dear boy — my dear boy, Master Davey, who brought us together, Barkis! That you sent messages by, you know! Won't you speak to Master Davy?" . . . . In the February 1850 instalment, comprising chapters 28 through 31, the second illustration, "I find Mr. Barkis 'going out with the tide'" (ch. 30), contrasts the comic "We are disturbed in our cookery" (ch. 28), both being group scenes involving characters from David's childhood. Although this is the second significant death in David's life, it is the first of his adulthood. 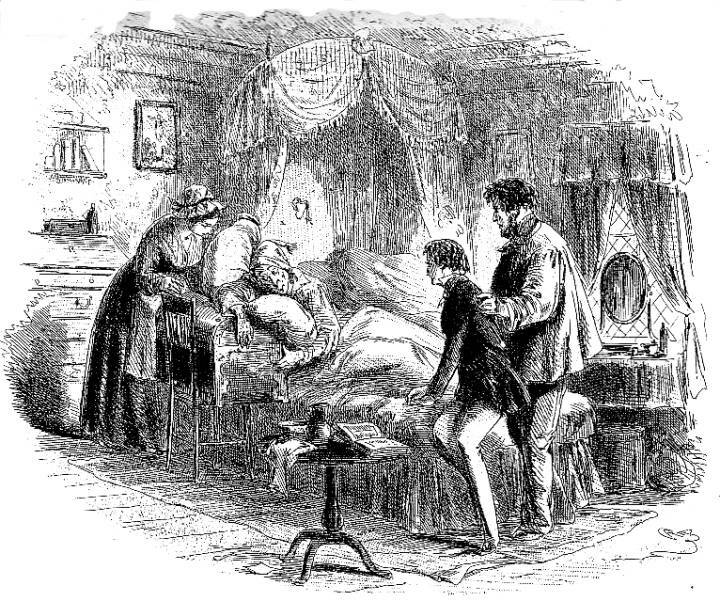 Death of the young in Dickens, as in the cases of little Paul Dombey and Little Nell in The Old Curiosity Shop, is often described with profound, overly sentimental religiosity, and such is the case of Phiz's realization of Barkis's passing with the tide. Cohen identifies the scene in the painting hanging just above Clara's head as Raphael's Transfiguration, to which the viewer's eye is drawn in an upward diagonal from the open bible (centre), Barkis's outstretched arm, and his wife's head. Balancing this juxtaposition is the smaller picture immediately above the noble head of Dan'l Peggotty to the right. However, the overt religiosity is relieved — one might even say, deflated — by Barkis's apparently hugging his carrier's trunk as he passes away in a blissful sleep, previously having been described as "half resting on the box which had cost so much pain and trouble" (9), his uncomfortable posture emphasizing his quirky nature to the end. The elaborate canopy above Barkis which Phiz employs to suggest the carrier's spirit ascending is foiled by an object over his head, hanging on the wall, as a parody of the religious symbolism, the key to the trunk, so precious to Barkis that he attempts to carry it off even in death. Dickens, Charles. The Personal History of David Copperfield, il. Hablot Knight Browne ("Phiz"). The Centenary Edition. London & New York: Chapman & Hall, Charles Scribner's Sons, 1911. Hammerton, J. A., ed. The Dickens Picture-Book: A Record of the the Dickens Illustrations. London: Educational Book, 1910. Steig, Michael. Dickens and Phiz. Bloomington & London: Indiana U.P., 1978.